From around 5pm UK time tomorrow, I’ll be in my kitchen playing guitar solos along to a range of songs and tunes selected by YOU. Request a track using the comment form below (preferably include a link to a good version on YouTube) and I’ll play along to it and post a video of the resulting mash-up. ANY song, ANY tune, ANY genre. I can’t promise I’ll do all requests but I’ll do as many as I can. This is an “as live”, virtual event – the performances won’t be streamed live but will be recorded and then posted up on the web right afterward, so you can “attend” without actually going anywhere and if you can’t make it tomorrow evening you can watch the videos afterward. 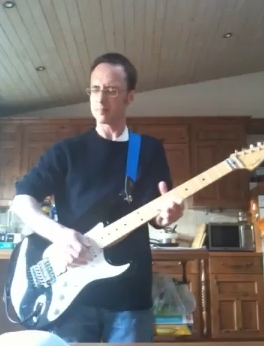 For a reminder of my first “bachelor kitchen guitar improvisations” from a few weeks back go to the blog home page and scroll down to the videos, or go to my YouTube channel and browse there.